Title Of Album: Greatest Hits! Greatest Hits was originally released in 1968 and was the first compilation album by The Association. Since its debut (where it peaked at #4 on the Billboard 200), it has sold over 2 million copies in the U.S. alone. 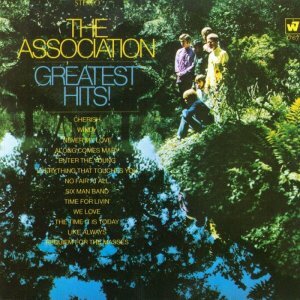 Beyond representing the best in '60s California pop, the Association blazed trails in album production and the folk-psychedelia genre. With the guidance of L.A. producers Bones Howe, Curt Boettcher, and Jerry Yester, the band deftly mixed airy harmonies, unobtrusive rhythm tracks, and subtle "Age of Aquarius" accents from harpsichords, Farfisa organs, fuzz-box guitars, trumpets, and bongos – at times, the sophisticated blend was held together by L.A. session players. And while the group successfully expanded their harmonic horizons on "Requiem for the Masses," they also went a bit beyond their strengths with Jefferson Airplane-esque rockers like "Six Man Band." Luckily, the majority of this hits collection focuses on the band's dreamy combination of polished folk, limber vocal arrangements, and wide-screen instrumental backdrops. The summery program also includes chart-toppers like "Windy," "Cherish," "Along Comes Mary," and "Never My Love," along with progressive pop-and-harmony tracks like "No Fair at All," "Everything That Touches You," and "Time for Livin'." A great introduction to the band's prime work from the latter half of the '60s.